Facade Contractor: Innovation Glass India Pvt. Ltd. In 2013, Cummins Corporation broke ground on a new technical center in Pune, India. Cummins designs and manufactures diesel and other alternative fuel cars, and has technical centers in 30 countries around the world. The new Cummins Technology Center (CTC) in Pune will employ 2,000 engineers from the region. 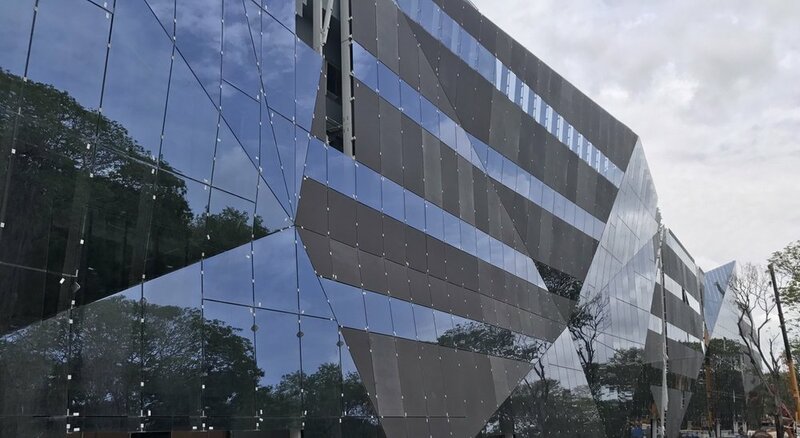 Cummins' forward-thinking and innovative work is manifested in the stunning architecture of the new campus, which features the worlds largest faceted wall made possible by VS1. VS1's radial fittings make possible complicated geometry, such as the multi-faceted CTC facade. Other systems would have required a horizontal member, but VS1 managed the extremely complex geometry of the facade without them. This achievement allows for unobstructed views between bays. VS1 also accommodates multiple panel types to be used on the same primary framing system; the CTC facade features a pattern of laminated glass and ceramic tile panels. VS1 was selected as the system of choice after an international bidding process over conventional solutions which would have used a more costly steel and drilled-glass approach.